The Book of Revelation is the Bible’s sting in the tail, with graphic descriptions of sinners getting what’s coming to them: slaughter, earthquakes, a bottomless pit and other such apocalyptic treats. In the King James version its tone is both prosaic and hectoring, making it challenging to set to music. 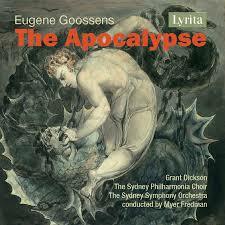 Eugene Goossens did so, premiering his oratorio The Apocalypse in 1954, two years before he was ejected from Australia for his scandalous interest in witchcraft. The work takes Handel’s oratorios as a model, but is reminiscent of Walton’s Belshazzar’s Feast in its flashy orchestral effects. Unlike Walton’s masterwork, it contains long stretches of solo narration and Goossens’ unvarying, stentorian setting of these soon becomes tiring. In this live performance, taped by the ABC in the Sydney Opera House in 1982, the words of the large chorus remain indistinct. In many passages, when the baritone proclaims: “And he spake in a loud voice, saying:”, a choral section follows where you cannot understand a single word. As conductor Myer Fredman admitted in an interview, the orchestral writing is the work’s most impressive aspect, although to my ears there is too much Mickey Mousing: bass drum bangs for the earthquake and so on. Orchestra and soloists shine, particularly Grant Dickson, Gregory Yurisich and Lauris Elms, but I would recommend the Chandos and ABC recordings of Goossens’ orchestral scores over this.